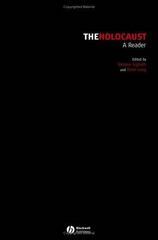 The Holocaust: A Reader 1 Edition This interdisciplinary collection of primary and secondary readings encourages scholars and students to engage critically with current debates about the origins, implementation and postwar interpretation of the Holocaust. Interdisciplinary content encourages students to engage with philosophical, political, cultural and literary debate as well as historiographical issues. Integrates oral histories and testimonies from both victims and perpetrators, including Jewish council leaders, victims of ghettos and camps, SS officials and German soldiers. Subsections can be used as the basis for oral or written exercises. Whole articles or substantial extracts are included wherever possible.